For a successful marketing campaign, it is important that you make use of every possible online strategy that is available to you. Among all of them the most important strategy that needs to be applied is content writing. Every business needs to provide detailed descriptions about their business mission and vision, products, and services to their customers. Without a proper content it is certainly not possible for people to understand what your business has got to offer, thereby your products also will not be sold. So, content writing is an important online strategy that needs to be applied. One of the best ways to bring your content to the notice of the people is by simply doing Search Engine Optimization or SEO. However, these days there are more innovative ideas and techniques that can be applied. 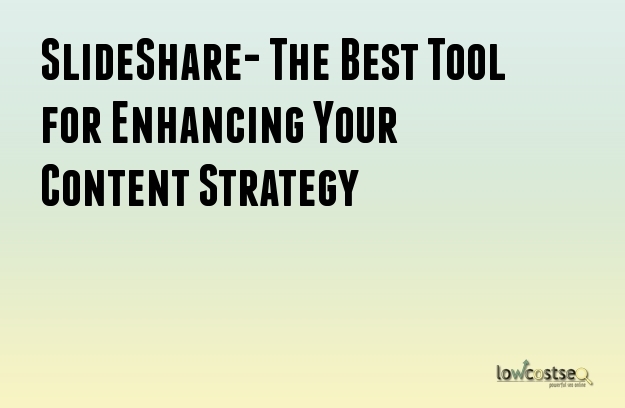 The new way of displaying your content is via SlideShare. This is a similar technique to YouTube, but here videos are not shared instead only PDF’s, infographics, and PowerPoint contents are shared. The SlideShare is among the top 100+ most visited websites in the world. This is one of the most promising platforms for displaying your contents. So, the question is how can you start using this software effectively and efficiently? Here are some simple guidelines for effectively using the SlideShare software. First make use of a simple dashboard which will help you to derive accurate analytical reports. This will help you to get varied insights about your content viewership, traffic rush, and viewers actions and many more things. For your business, it is important that you create a branded SlideShare page. You can do this by selecting an attractive looking theme. Do your own customization of colors, banner images, and backgrounds. Always try to create a call to actions by adding a link to your specific landing page, website, and blogs. This will help you to capture leads. Make sure that you upload office files or PDFs. This will help in increasing the reach of marketing documents. Tap on the ‘more topics’ option for the ‘explore’ page where SlideShares are organized keeping in mind the topics. The best way to track your lead is by forwarding lead forms in varied places in the documents. You can also make them appear when a user is requesting for a download. Visual impact is one of the best ways to keep customers engaged. Make sure that you have alluring layouts and of course graphically pleasing fonts, images, and colors. This is basically a free application which is offered via SlideShare. This application helps in creating beautiful but simple presentations. Infographics are the best way to make people understand your messages. This is the reason why make sure that you post infographics on your SlideShare and try and embed them where ever you are publishing. Journalists make use of SlideShare as their research tool. This also helps them to extend their media presence. This is mainly an invitation-only program that is created by SlideShare in order to forecast the works of industrial experts who are into the regular habit of creating quality decks. Below is a brilliant infographic by SlideShare outlining the important of using Slideshare in your content marketing campaigns.